One of my favorite things to eat is warm bread that is freshly made. The flavor is usually unbeatable in combination with the crisp crust and soft middle. Even the next day the same bread usually doesn't taste the same, not necessarily any worse, just not as good as when it's fresh from the oven. Adding natural colors to bread always adds visual excitement and adding flavors also contribute to deliciousness. The process of making bread can seem like a daunting task to some people but when the bread is baked it makes it all worthwhile (to me at least). I used to make bread randomly just for the joy of eating it. Then for a while my son couldn't have soy which was in most bread bought at the grocery store so I made it out of necessity each week. Now he can have soy and so I'm back to making it for fun :). The idea for this bread is based on the Improv Challenge this month which is hosted by Frugal Antics of a Harried Homemaker. Each month there are two different items listed and we are challenged with creating a recipe with them. In previous challenges I made Individual Cherry Almond Trifles and Peanut Butter Fondue with Jelly Filled Pound Cake. The recipe for this month's challenge must be made with carrots and peas. I had a few ideas floating around in my head and I stumbled on this one and thought it may be fun. Swirled colors of bread is always better than plain, I mean really. 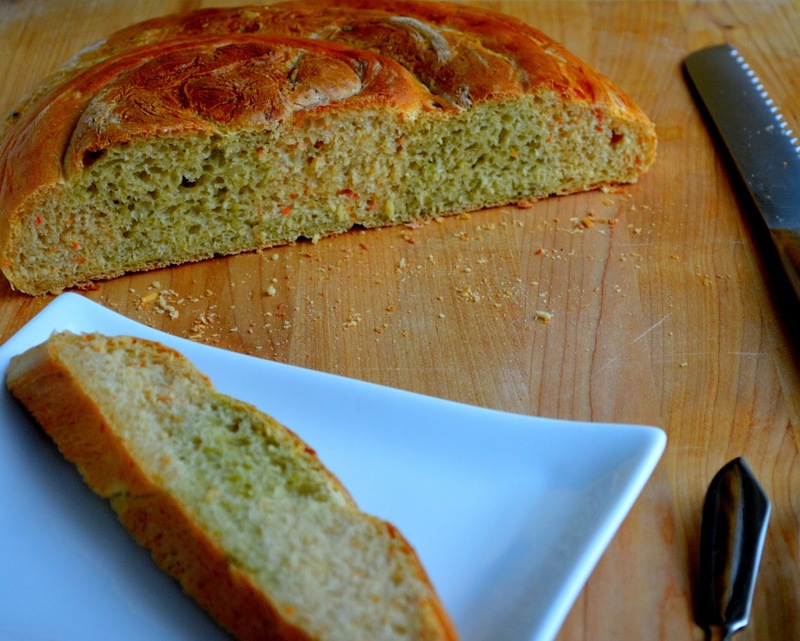 This bread is prepared in two small batches, one with pureed carrots and one with pureed peas. They are rolled into ropes and twisted together to form a boule-like shape with a spiral pattern. I think it's very pretty when it is cut because there is a pastel green and a pastel orange. You could always add food coloring (2 or 3 drops) just to make the colors more pronounced, but I prefer natural coloring when possible. 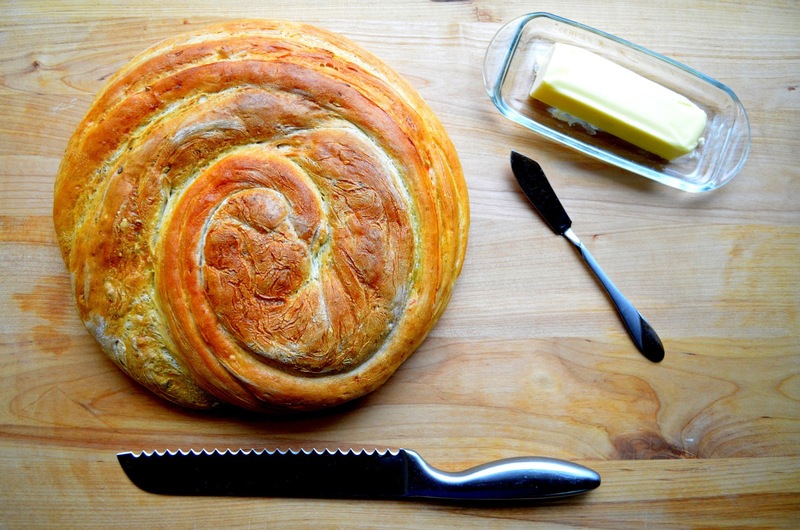 This bread would look beautiful on the dinner table for Easter, or maybe at a brunch. You could also cut it horizontally and make it into a giant sandwich that's cut into 12 wedges and that would be pretty. 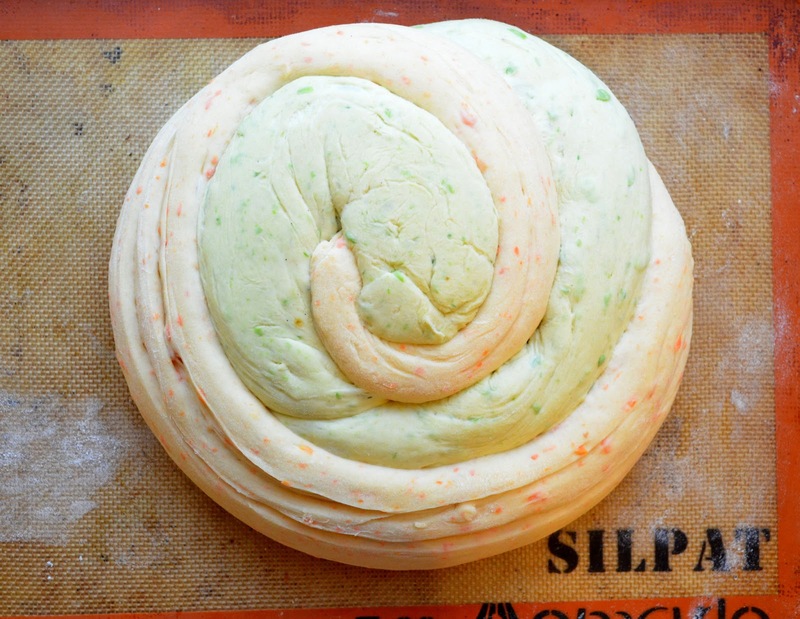 I had thought about rolling out the green dough and wrapping it around the orange dough that had been formed into a ball so it would look like a carrot when it was cut, but I decided on the spiral pattern instead. As always, if you have any questions please ask! Happy Baking! 1. In the bowl of a mixer stir together 1 ¼ teaspoons of yeast with ½ cup plus 2 tablespoons of water. Let the mixture sit about 5 minutes or until creamy. Stir in 1 cup flour, 1 teaspoon salt, 1 teaspoon sugar, and 3 tablespoons of mashed carrots. Add 1 more cup of flour and blend with the dough hook of a mixer on medium speed until it comes together, then 3-4 minutes longer (or 6-8 minutes by hand). Additional flour may be necessary if kneading by hand. In the mixer the dough may still feel tacky but that’s okay, don’t add too much flour. 2. Put the carrot dough into a lightly greased bowl, cover with a kitchen towel and set aside. 3. In the same mixer bowl (cleaned if necessary) repeat the process with the remaining other half of the ingredients (yeast through sugar, and the peas). Place the dough in another lightly greased bowl and cover with a kitchen towel. Set both bowls aside to rise for 1-1 ½ hours or until doubled. I like to preheat the oven on 150F for 45-60 seconds to warm the oven, then turn off the oven, and let the dough sit in the oven to rise. 4. Take each dough out of the bowl, one at a time, punch it down, and roll it into a log on a lightly floured surface (as long as you want, mine were probably around 16”-18” long). Lay the logs side by side on a cookie sheet then twist them together into a spiral shape and tuck the end under. Let the bread round rise for 20-25 minutes or until almost doubled in size. 5. When the bread is almost done rising, preheat the oven to 375F. In a small bowl whisk together the egg and milk. Brush the egg wash evenly onto the loaf of bread. 6. Bake the bread for 35-40 minutes or until it is golden brown on the crust and sounds hollow when you tap it. Remove from oven, move to cooling rack to cool completely. (If you leave it on the cookie sheet too long it may become soggy on the bottom). 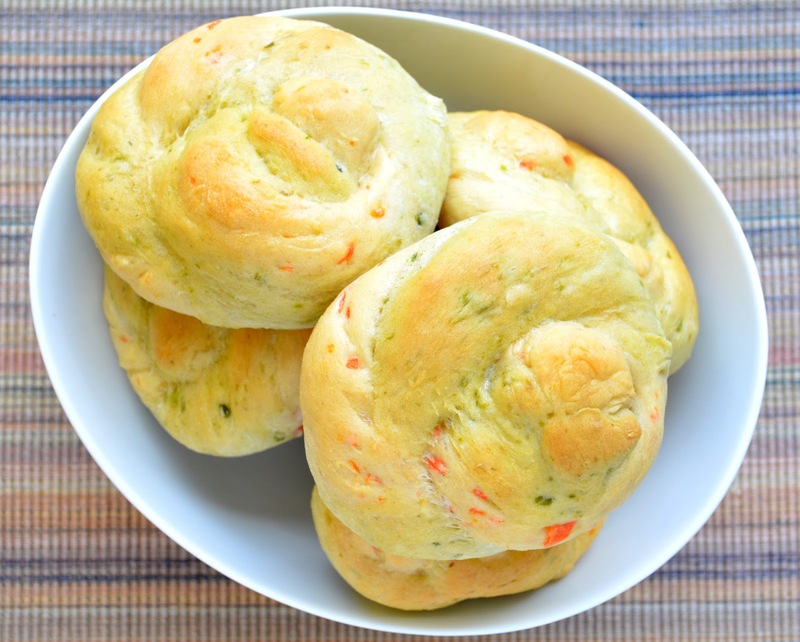 *If you would like to make dinner rolls, divide the dough into 10 pieces (for good sized rolls) and bake for 17-19 minutes. Oh! Your bread is beautiful! I love the way you twisted the two flavors together. 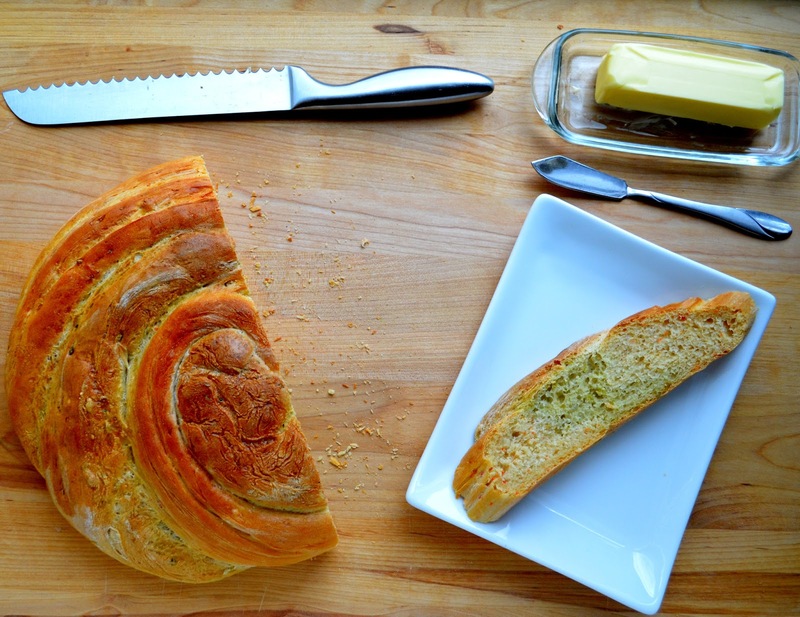 Love the "twist" idea -- I'd wondered if the challenge ingredients would work with a yeast bread but wouldn't have known where to start. Sounds and looks delicious! I had wondered that too! It turned out really well. The loaf was gone within 24 hours because we all kept eating it! Perfect for Spring, Easter, Passover =) Seriously, your artistic combo of peas and carrots in bread is beautiful =) Bravo to the pastry chef! Thanks :) I love the pastel colors and how Springy it looks. How pretty! Very creative use of this month's ingredients. I bet it was delicious. You definitely get the award for most creative thinking this month. What a gorgeous bread! I agree with you. Almost nothing beats bread warm and fresh out of the oven. Love the swirled colours! Awesome choice! Such a marvelous loaf! I love how you swirled the two doughs...beautiful! Your swirled bread looks amazing and I'm always so impressed by people who do make warm delicious bread...as I'm a failure at bread baking. My Improv Cooking Challenge entry this month: Mom's Beef Vegetable Soup, hope that you'll stop over and check the recipe out. The vegetables worked out really well. I may try some other ones in the future! This bread looks AMAZING!! What a fun way to sneak in some veggies as well. Thanks for sharing these at Two Cup Tuesday at Pint Sized Baker. Pretty bread and sounds delicious! Happy Almost "Pi" Day Everyone!